If you were a developer being asked to design a boss for Cataclysm, what boss would you create? Would it be a vicious warrior, a crazy shaman, a cheating rogue, an overpowered mage, or a mix of all of these? What would his more letal skill be? What type of lair would he have? Obviously I’m a tad behind on getting to this topic, but my computer crashed. Anyway! The topic at hand! I’ve always been interested in Druids (and Dragons, but that’s another story for another day). I find the Warcraft lore for Druids absolutely fascinating. The Emerald Dream is something I’ve always wanted to see implemented in the game, and thus follows the implementation of The Emerald Nightmare. Saz wrote an amazing entry on the end boss of an Emerald Nightmare raid (specifically N’Zoth… N’Zath… that Old God guy). My boss would fall more under “end boss of Emerald Nightmare dungeons”. For those that don’t know, I’m huge into DnD. One of the 3.5e campaigns I played as an undergrad, I rolled a Druid. The DM eventually gave me an animal companion which was a desert lizard of sorts (based upon the setting chosen by the DM and the origin of the Druids), and I was eventually able to pick out this epic weapon, that, when held to the ground for a certain number of rounds, would turn into a Treant through the rest of the encounter. C’mon dicey, don’t fail me… n–CRAP! Nat 1 again. Yep, a confirmed critical failure. So, instead of the treant grappling the mob, he turns around and grabs my lizard companion. The the DM has me roll again. Uh oh… a Nat 20! That save me, right?! Wrong. The treant makes a critical success in vaulting the lizard onto the end of a polearm (or some other such weapon) held by one of the mobs. Needless to say, I was foaming at the mouth, let alone my character. Since I wasn’t going to get a new companion, I decided to hand off my Druid’s sheet to the DM and roll a Noble/Rogue for the rest of the campaign (which happened to be more fun to RP in the long run). The story I gave the DM to run with (which never showed up, but was fine by me) was that my Druid became a Blighter, driven mad by the circumstances in combat. Now, what’s a Blighter, you ask? Well! Let me just drag out my Complete Divine 3.5e and give you the description! When a druid turns away from the land, the land turns away from her. Some ex-druids make peace with this change; others seek to restore the bond. A few, however, actually embrace their disconnection from nature and become forces of destruction. These few, called blighters, bring desolation wherever they tread. A blighter gains her spellcasting ability by striping the earth of life. A swath of deforested land always marks her path through the wilderness. The vast majority of blighters are nomadic loners constantly in search of green lands to destroy. Some are grim; others laugh at the destruction they wreak. Almost all, however, are friendless and mad. 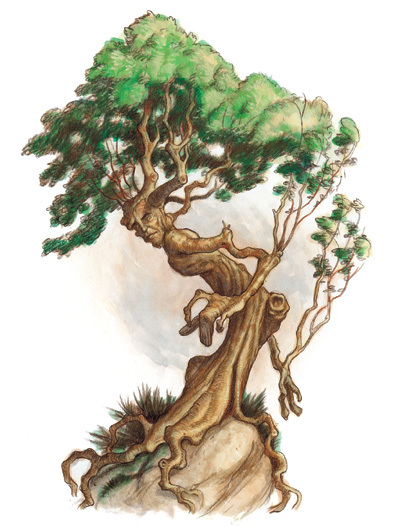 What puts them over the edge is the knowledge that nature gets the last laugh: To gain their spells, they must seek out the richest forests of the land, even if it’s only to destroy them. Thus, even though they’ve turned away from nature, they must constantly return to it. Dungeons and Dragons Complete Divine, David Noonan. This DnD character has been my inspiration this BA:ST. I started to wonder, “Would the Warcraft equivalent of a Blighter be one corrupted by the Emerald Nightmare”? I came to the assumption, that yes, it would. The dungeon would have two or three bosses before you come to the Blighter (who is the final boss). I’m not sure what it’s name would be, but it would definitely be a Night Elf. According to DnD, Blighter’s are mostly humans or elves. In Warcraft, Druids can only be Trolls, Night Elves, Tauren or Worgen. Hm. Guess I’m stuck with a Night Elf. But, we haven’t really had any evil Night Elf bosses we’ve had to face, right? Should be something new. Contagious Bite: A disease that ticks for massive damage until dispelled or falls off. Lasts for 10 seconds. Placed upon a party member by the animated dead. Animated Dead: The Blighter reanimates dead animal corpses at 75% and 25%. Three animals will rise, and will stay up until burned down. Plague: The Blighter casts a rolling wave of disease at the party at 50% health. He will have a short speech in which the players can move out of the 15 foot radius. If a player gets it, they will get hit for 150k damage, before resists. 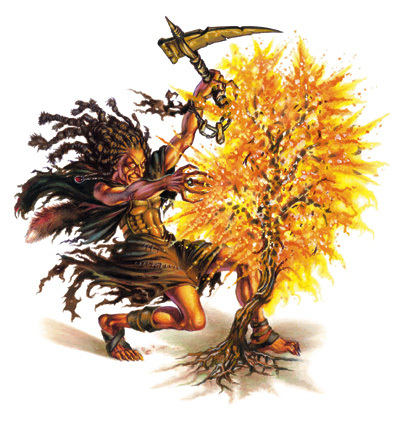 Deforestation: The Blighter lights the vegetation on fire in order to gain more energy for his spells. The deforestation will spread for four seconds and leave charred earth in its place for another two seconds. Corrupted Bear Form: The Blighter casts an Undead Bear Form on himself. Gains all abilities available to Bear Druids. Corrupted Wrath: As Wrath works now for druids, but hits for more. Mr. Blighter is channeling on his starting platform at the front of the circular room filled with live trees and burned trees. Around him are corpses of various animals. The tank extraordinaire would bring him to the middle of the room, and the DPS would start whacking him. He’ll melee the tank, and cast single-target Corrupted Wrath on the raid until 75% (Corrupted Wrath can’t be interrupted). At 75% he will become immune to damage and will channel Animated Dead. Three of the animals on the platform will rise, and attack the party. They’ve no aggro-table and hit for minimal damage, except for their Contagious Bite. Mr. Blighter will stop channeling and go back to his Corrupted Wrath and hitting the tank while the dead are up. The dead must be burned down ASAP. Once the dead are down, the raid can go back to whacking on Mr. Blighter. At 50% he will run back to his platform and yell something and channel for about three seconds. This is the warning to the party to GTFO, because he’s about to cast Plague. It can be totally avoided if you move far enough away. Once he’s done casting Plague at the party, he will run back to whomever has threat. Rinse and repeat with the Corrupted Wrath business. At 25% he again becomes immune and channels Animated Dead. Same deal with the adds–burn them down and then back to him. Ah, but you say I’m forgetting about his Deforestation and Corrupted Bear Form? Here’s the kicker–he casts them throughout the phases! Every so often he’ll lay down a spot of Deforestation when he runs low on mana from casting Corrupted Wrath on the raid (about five or six casts). At about this time, he’ll shift into Corrupted Bear Form so that the Deforestation can spread and he can regain mana. Once his mana is back to full, he’ll shift out of Corrupted Bear Form and go back to spamming Corrupted Wrath on the party. So, I'm a month and a half late on commenting on this but…thanks for the link hun!